How to start a profitable Goat Farming business in Nigeria. Goat farming is one important aspect of agricultural diversity that has not been harnessed to its full potential in Nigeria. The search for jobs and unemployment rate has really been on the increase, while profitable ventures are being overlooked in a modern Nigeria probably largely to its unappealing nature. I am writing this guide to help direct and improve the mind set of younger Nigerians to embrace agriculture as this is the only viable means out of Self Pity, poverty, lack while improving Self Worth, status in the society amidst restoring lose confidence. With the teaming number of graduates being unleashed into the labor market yearly, while government has done little or nothing in readiness to providing fulfilled jobs had since called for a great concern and goat farming will provide succor I believe. Let me be frank with you, if you are sited right there looking and hoping on government promises to create jobs that will meet your standard, permit me to convey my unreserved pity and regrets on your situation and ignorance. You need to start doing something with your life immediately, goat farming should be a direction to consider. Goat Farming is an aspect of Agriculture which involve rearing animals, typically referred to goats. Agriculture is the act and science of growing crops, rearing animals and production of raw materials for industry use. With the definition you will notice it has three branches namely: Crops, Animals and Raw materials. As well I will concentrate on Animals particularly goats in this guide. Goat is a Herbivores animal which means it feeds on vegetation, domestic goats sometimes feed on trash and domestic left overs within their environments. The demand for goat meat is highly on the raise as such available farmers have not been able to meet up with these demands to a large extent. 2. The meat is good for consumption, highly protein value and less fat than chicken. 3. Profitable business with a high return on investment. 4. Breast milk is used for making cheese and butter by beverage industries. 5. Breast milk is high in calcium and fatty acids but low in cholesterol. Goat milk is closer to breast milk than cow milk in the sense that it contains B-casein and a lower level of as 1-casein. It as well glitters the skin. 6. The dung is used as compound manure/ fertilizer to boost crop yield through soil viability. You can pack and sell the dungs to farmers who are in constant need of it, everything about goat is money. The milk aspect has not been fully utilized in Nigeria but will soon take off. In Nigeria we have arrays of goats suitable for different climatic conditions and all that. How many goats do I need to start with? It’s advisable to start with at least 25 females (does) and a male (buck), this will help you to build pens gradually for expansion if you want to go into commercial system. There’s a lot to learn about goat farming, so start small and improve your goat farming over time. Mating: This is crossing of the female goat by the male goat which the product is an offspring called a kid. The doe can give birth to one, two or three in a single birth. Female goats (doe) can get pregnant between 7-10 months old this equally depends on the method of feedings while the buck reach puberty between 4 and 8 months old, the buck should be well fed for optimal performance. 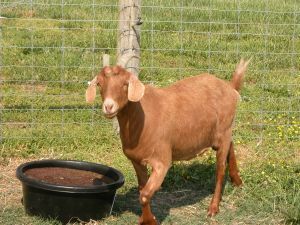 One male goat can bred about 25 goats, it’s always advisable for a buck to be a year old before using it to breed a doe. Gestation Period: This refers to period of pregnancy in a female goats. It normally takes 145 to 155 days which is about four to five months period. Depending on the breed, it usually advisable to breed a doe once in a year for health benefit and all that. At worst case scenario a kid should go for about N4000, do you research in your local market it could be lesser. Cost= 25 x 4000= N100,000. If at maturity they got bred and give birth. Some will give birth to 1, 2 or 3. For this analysis let’s stick with one. 1 x 25 = 25 goats these are now the offspring, with combination of both male and female you now have a total of 25+25 goats= 50 goats in your farm by the first year. 24+18= 42, remember you still have 8 male goats from the analysis? If these 42 got bred and still give birth to one each that’s extra 42 goats. It then stands that 42+42= 82 goats + 8 initial bucks, you will now have a total of 90 goats. Say you want to sell 70 out of the farm. A mature goat will go for nothing less than N14,000 at worst case scenario. 70 x N14,000 = N980,000 That’s what you will receive from the market. Remember some does would have given birth to 2 or 3 each which we did not include in our calculations, let’s say in this space of time out of 70 we have extra 20 from multiple birth. 20 x 14,000= N280,000, extra. Now N980,000 + N280,000= N1,260,000. Just within the first two to three years while you still have about 20 adult goats in your farm, isn’t that a good business? You can keep growing the farm till you won’t be able to calculate your money anymore. You may choose not to sale and keep recycling the process. Feeding for goat is not that expensive as they feed on herbs and domestic remnants. You can make forages for their feeding in dry season while you compliment with other dry food materials obtained from cereals, maize etc. Goats should be well fed with calcium and a relative salt. The major source of nutrients is the hay, do not make sudden change in food, this could lead to digestive problems. Housing is an important aspect of goat Farming business. Security should be considered against thefts, thus should be adequately fenced off. The floor should be neat at all times. Goats are neat animals as such do not cherish a damp floor. Wage against insects and rodents. Employ the services of a veterinary doctor it’s necessary for administering vaccination from time to time to maintain a healthy goat farm. Common ailments in goat farm are: Tuberculosis, Salmonella infection, Tapeworm, Rinderpest, Nitrate poisoning etc. Be on the watch out for their symptoms for timely prevention of death. It’s good to ascertain the health status of breeds being introduced to the goat farm either locally or internationally. Selling your goat is very easy in your local market, make your enquiry for what the price goes for within the period. Customers will as well come buying in your goat farm. Do not allow them entrance into your farm for so many reasons. Goat farming in Nigeria is a profitable business embrace it with two hands and get yourself out of poverty and self pity emanating from unemployment. Like and share this post while you drop your questions and comments below.